While social media can be one of the best marketing tools to drive traffic and sales to your eCommerce site, a lot of businesses get it wrong. When you post monotonous content with no strategy or schedule plan, you probably won’t see much engagement from your followers, nor will you see your network grow significantly. On the other hand, if you develop a strategy around what you’re trying to achieve on social media and create a social media content calendar, you have the best chance of leveraging social media to attract more customers and continually engage with existing ones. Your social media marketing is completely worthless if you don’t have direction, purpose, and goals. Sure, you want more sales, but you need to be extremely specific when it comes to defining what you want to achieve. It’s important to be detailed and realistic with your social media objectives. For example, if you want to boost eCommerce sales from Twitter, by how much? You’ll first need to know how many sales come from that channel so you can quantify what an increase would look like. Your analytics can help with that. Realize that social media is great for branding and establishing you as an expert, so your goals — some of them, anyway — might need to veer away from creating a dollar amount ROI and more on getting a return on engagement. What the heck does that mean? It means that instead of looking to make an average of $X for every tweet or Facebook update, you look at how many likes, shares, retweets, and followers you attract. These metrics might not seem like much, but when you consider that marketing is the long game, every one of them can represent a future sales opportunity. You should set up different goals for each social channel, since people behave differently on each. For example, you likely could grow the number of people who share or retweet your content on Twitter, but on Facebook maybe your goal is to boost the number of likes a post gets, since people are more likely to show appreciation of content that way. Once you’ve established what you hope to achieve through social media, determine the best way to accomplish those objectives. Again, looking at metrics is helpful. If, for example, you want to increase your followers by 1,000 on Twitter over the next three months, you need to see what you’ve been doing to attract followers and amp up your efforts accordingly. Perhaps you’ve been following 50 people a week, and have gotten about 10 new followers weekly (not everyone you follow will follow you back). If you want to reach your goal of 1,000 new followers, you’ll clearly need to step it up. Maybe you decide to follow 100 new people a week instead, with the aim that you’ll reach your goal of new followers within 12 weeks. Breaking down your goals into bite-sized action steps will pave the way for your social media calendar. First, understand that having a structured timeline for the types of content and updates you post, as well as defining when you’ll publish them on each social media channel has immense benefits. For one, you’re not using the “helter skelter” approach to social media, posting when you remember to or sharing whatever content strikes your fancy (like that cute cat video that has nothing to do with your brand). Instead, adhering to publishing updates that align with your strategy and objectives will keep your audience interested. Also, you can ensure that each of your company’s social media profiles stays active with a variety of content shares and posts. 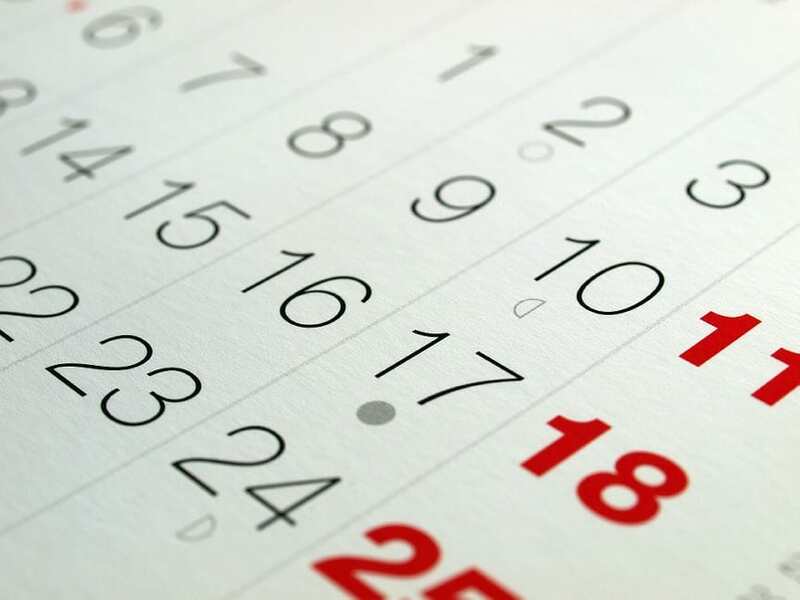 The first step in creating your social media calendar is identifying which days and time periods you need to be active on social media in order to reach your intended audience. If your network is B2B, scheduling updates Monday through Friday, 8 am to 5 pm should suffice. If you’re trying to reach consumers, you might be better off posting in the evenings and on weekends. Not sure when the best time is? You can see what works for other people or simply test out different times then look at your social analytics to see which updates get the most play. Next, determine the appropriate cadence. Because of the fast nature of Twitter and Instagram, you can get away with posting updates as frequent as every hour, while on LinkedIn, Google +, and Facebook, one or two updates a day should suffice. It’s important to not bombard your followers with your content! Now you’ll need to get specific about the types of shares and updates you’ll do at each time. Diversity is best! Every one of your followers likes a different type of content. Some will prefer videos, while others want to read blog content or engage in conversation with your brand. The following types of social shares cover the best types of content to include as a mix in your social media calendar. Social media has the potential to refer a lot of traffic to your business blog, so make sure each and every post gets its moment in the spotlight. You can automate the initial share of a post to each social media site through tools like TwitterFeed, but you should also schedule additional shares to maximize the number of people that view a given blog post. On Twitter, you can get away with sharing your blog post daily, but on sites like LinkedIn or Facebook, once should suffice. Sharing Tip: Customize each additional share after the automated one. Use quotes, statistics, or thought-provoking questions to get people curious enough to click. It’s important that you’re not completely self-centered with the content you share on social media, and that you include other articles that your audience will find useful. The benefit to doing this is that you become known as a go-to resource for content and news in your industry. Sharing Tip: Subscribe to blogs that your followers are interested in, then share the posts you like best with a well-thought-out comment to foster dialogue. The fact that ⅓ of all online activity is spent viewing videos should tell you of the popularity of this visual media. When shared on your social channels, videos can provide diversity and something that will catch people’s eye as they scroll through their newsfeeds. Your videos can be product demos, interviews, behind-the-scenes glimpses, or just something fun that speaks to your brand’s image. Sharing Tip: Make each video do double — or triple! — duty for you. Upload it to both YouTube and Facebook, as well as embed it in a blog post and in an email to your subscribers for maximum viewing. Photos are another excellent visual component to include in your social media shares. The fact that people slow down when they encounter a photo on Twitter or Facebook means you can capture more of users’ time when you include one. Again, keep the images you use aligned with your brand’s voice. Product photos — especially images of your product in action — can spur interest in your products, but you can also share photos of your team being silly or photos of scenes that speak to what your brand is all about. Instagram is especially a good venue for images that aren’t related to your product at all. For example, if you run a kitchen utensil eCommerce shop, your Instagram stream could include images of appealing dishes or ones that illustrate steps in cooking a recipe. 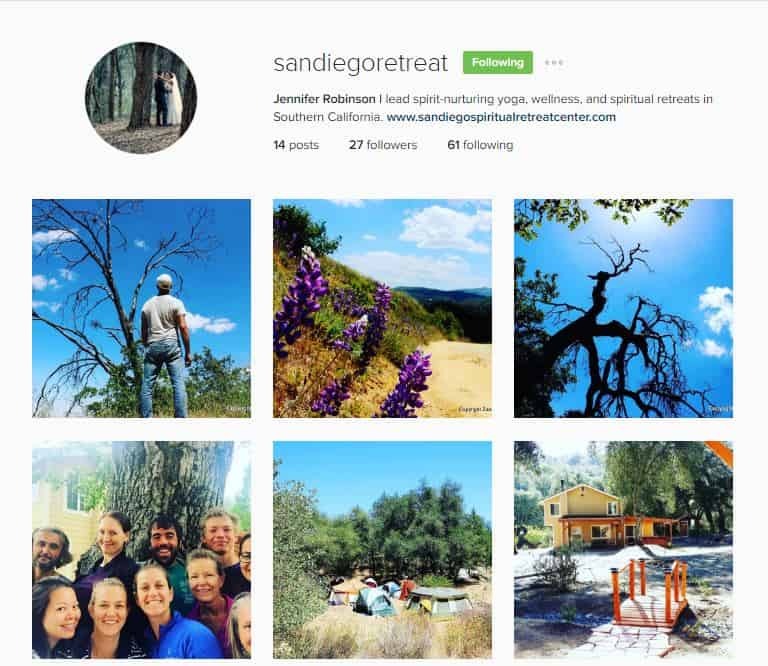 Sharing Tip: Maximize tools that let you share an image on multiple social channels. For example, if you post an image on Instagram, you have the option to also share it to your Facebook, Tumblr, Flickr, and Twitter streams. It might not seem like you’ve saved much time, but it adds up! Your stream should be about 20% promotional and 80% other. That means that instead of talking about how killer your product is, you should be engaging in conversation and sharing other types of content and information. Don’t forget the fun! You might post a recipe on Fridays, a quote on Mondays, or just something silly in between. Just keep it in line with your brand messaging. That means if you try to be serious and professional with your brand’s voice, you shouldn’t post GIFs of people twerking. Sharing Tip: It may take a while to see what types of updates in this category really resonate, so pay attention to likes, shares, and retweets in this category.A true account of how Dr. Robert Ealy went from being a traveling ER physician to the Healthcare Evangelist he is today, and how you can get the same results using his proven methodology. 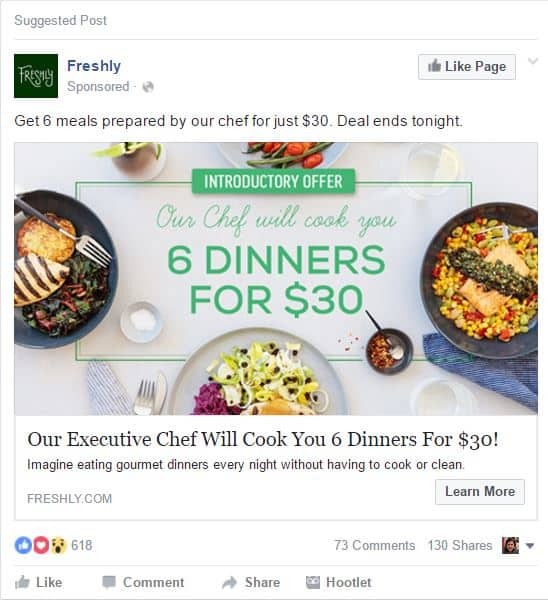 Sharing Tip: You can get even more views of your promo if you boost it on Facebook. For a relatively low investment, you can take an ordinary promotional post and get it in front of more than just the people who follow you. Because these Suggested Posts look like any other posts, people will share, click, and like them. 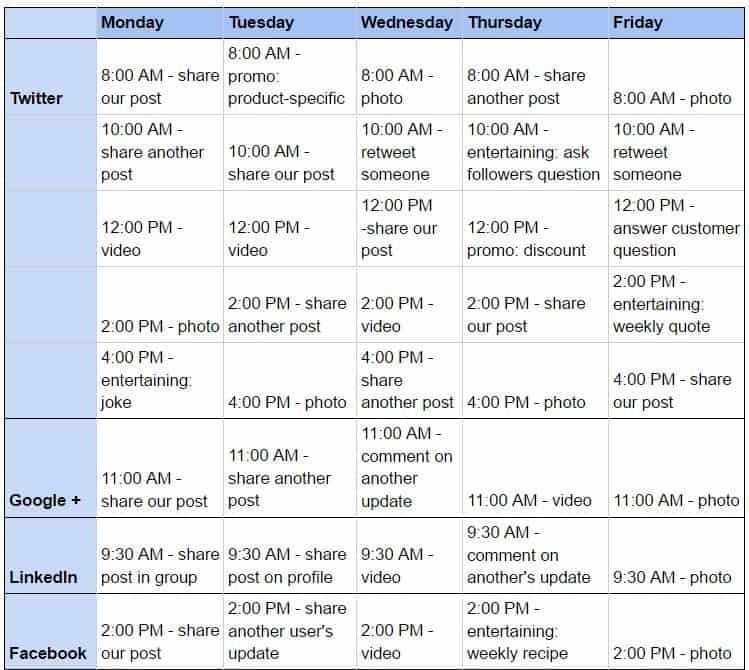 Now that you’ve got some different types of social shares to add to your calendar, let’s complete it. Spread out the six different types of shares across your calendar. You’ll notice that I staggered the “share our post” at different times each day. This can help you assess which time of day people are most receptive to reading and clicking on your content. After a few weeks using your calendar, you can tweak the times. Maybe you find that you’re better posting the same types of content at the same time each day. Your metrics will guide you. One of the major perks of having a social media calendar is that it cuts down on the brain power you need to post updates. Just fill in the blanks for each square, and you’re covered. Also, you can schedule these updates in advance, spending maybe an hour a week doing so, then pop in once a day to respond to people who have reached out to you via social media. Having a bit of strategy as well as a plan for what you’ll post when makes social media management that much more successful. 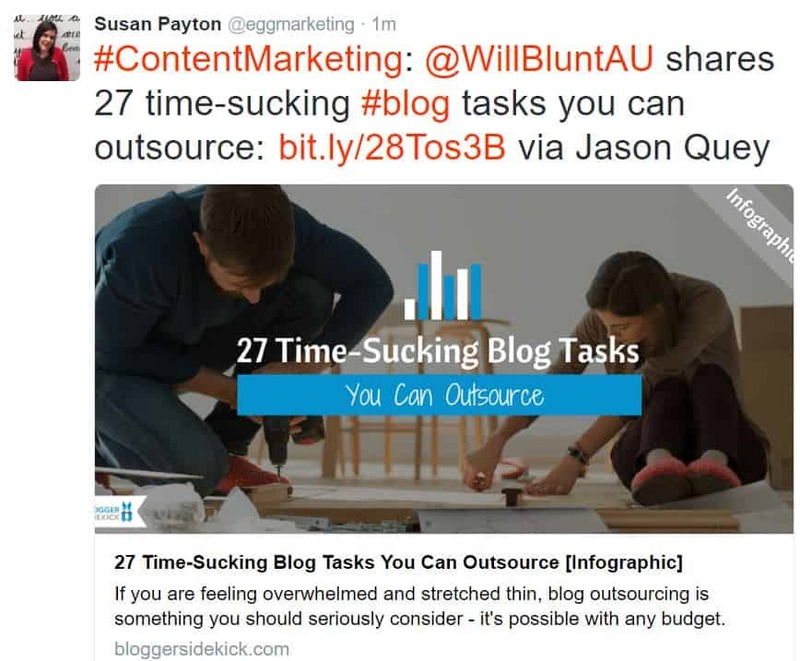 Susan Payton is the President of Egg Marketing & Communications, a content marketing firm. She’s written three business books, and blogs about small business on sites including Forbes, AllBusiness, The Marketing Eggspert Blog, and Tweak Your Biz. Follow her on Twitter @eggmarketing.